The majority of people buying diamonds in this modern age are not likely to know the origin of Cape Diamonds, however it is a term that has very special meaning to those of us who were raised in the diamond business. As a fifth generation diamond cutter, Brian Gavin has fond memories of watching his father and grandfather cut Cape Diamonds. It is in celebration of those moments, those memories, times of distant pasts, that we proudly introduce the Cape Diamond Collection by Brian Gavin. If you find yourself pondering the question "What is a Cape Diamond?" you are not alone, but this is only because the terms used to describe the origin of diamonds and their individual characteristics has changed dramatically over the years. Especially since the inception of the diamond clarity and color grading scale introduced to the industry by the Gemological Institute of America (GIA) in 1931. Prior to that diamond colors were described using more romantic terminology, such as Jager, River, Wesselton, Crystal, Cape, and Silver Cape, instead of simple letters of the alphabet. But perhaps we're getting ahead of ourselves, let's back up a moment. For as long as there has been written, recorded history, diamonds have been sought after as treasured articles of desire. In the first century A.D., the Roman naturalist Pliny stated: "Diamond is the most valuable, not only of precious stones, but of all things in this world." It is believed that diamond trading in India occurred as early as the fourth century B.C., but the critical turning point in the history of the diamond market as we know it, occurred in 1867 when diamonds were discovered in the British Cape Colony. This discovery launched what are now known as "the diamond fields of South Africa" and the diamonds that originally came from there were commonly known as "Cape Diamonds." The discovery of diamond fields in Cape Town, South Africa resulted in diamond production growing ten-fold over a period of ten years.i The discovery of such vast diamond resources in the Cape region of South Africa is what made it possible for the masses to enjoy diamonds to the extent that we wear them today, prior to that discovery diamonds were reserved for royalty and the extremely wealthy. What is a Cape Diamond? No doubt you realize by now that originally the term "Cape Diamond" referred to diamonds that originated from the British Cape Colony in South Africa. Diamonds from this region tended to be faint to light yellow in color,what is presently known as K-color to Z-color. 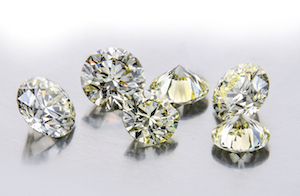 With the passage of time, all diamonds in the faint yellow to yellow spectrum were referred to as Cape Diamonds, regardless of where they originated from. According to an article on Cape Diamonds that appeared in Modern Jeweler Magazine in January 2011, London jeweler and author Edwin Streeter devoted an entire chapter to the momentous Cape Diamond finds in his book "Precious Stones" written in 1884. The article then indicates that when W.R. Cattelle, another prominent London jeweler, published his book "The Diamond" in 1911, that the term "Cape Diamonds" was used to describe diamonds with a slight to pronounced yellowish cast. It seems that over the course of less than 20 years, the term "Cape Diamonds" transitioned from a reference to the origin of a diamond, to a spectrum of diamond color. There does not appear to be an explanation as to why the transition from diamond origin to diamond color occurred, but for most of the past century, Cape Diamonds was widely recognized as a reference to color. Color grading follows a scale describing the "whiteness" or absence of secondary color in a white diamond. At the top of the scale a diamond will appear white, and at the bottom yellowish or brownish. The top color grades, D, E, F, describe a diamond which appears colorless against a white background. In near colorless diamonds, G, H, I, there is a slight trace of color which will not be apparent to the untrained eye. 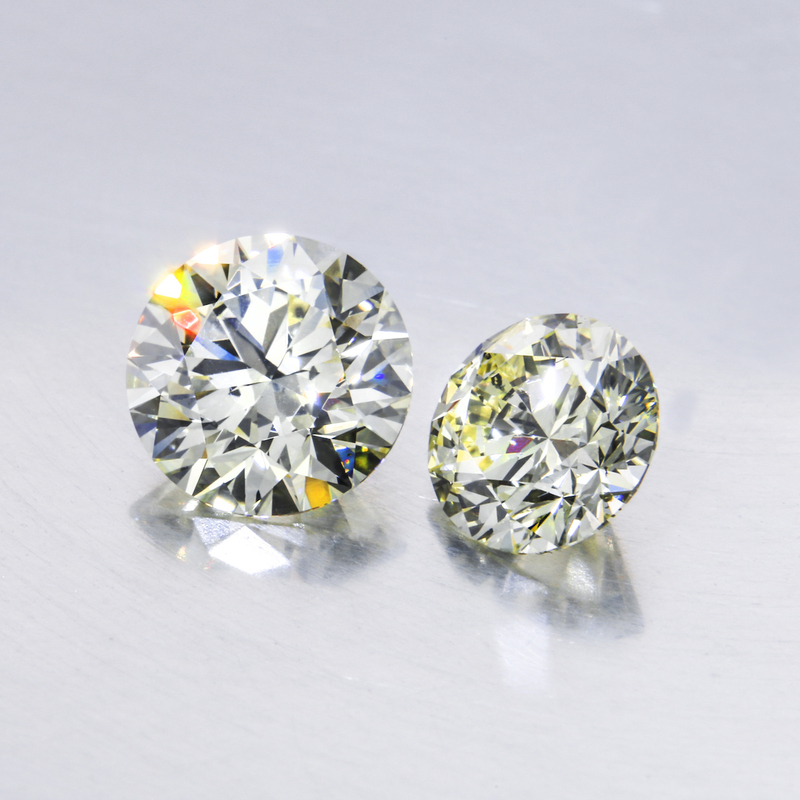 Stones 0.50ct or less will look colorless. Diamonds graded J, K, L, will have noteable traces of color. Small stones in this range will 'face up' colorless when mounted but larger stones will be tinted. Diamonds graded M-Z will display a yellowish tint even to the untrained eye. Z+ color grade indicates that the diamond is of fancy color and therefore fall into a different price bracket. Regardless of their faint to deep yellow gold, which tend to be avoided by many people buying diamonds online, Sotheby's diamond division is known to auction Cape color diamonds of significant value and very large size, several times per year. A thirty-one carat pear shaped, Cape color diamond was sold by Sotheby's awhile back (see link below). The diamond exhibited a wonderfully warm, inviting color that is exceptionally beautiful. Brian Gavin Signature diamonds in warmer colors such as J-K-L-M have always been popular with our customers. The Cape Series by Brian Gavin provides people with the opportunity to own a spectacular looking diamond in a carat weight they might not otherwise be able to afford. It is amazing how truly stunning Cape diamonds can be when they have been cut properly. The diamonds featured in Cape Series by Brian Gavin are cut to the same exacting standards of other Brian Gavin Signature Diamonds, and offer the same incredible Light Performance. Today's modern woman wears a multitude of hats, each representing incredible commitment and responsibility, she is likely to be a wife, a mother, an employee, and perhaps even your boss. Not only is she is expected to manage all of these different tasks, but she is expected to excel in achieving each and every one of them... she is expected to be a super hero, with super hero powers, and that is why she needs a Cape Diamond from Brian Gavin, because everybody knows that every super hero wears a cape! A Cape colored diamond from Brian Gavin, representing the warmth and power of the sun! Her ever changing world, as sensuous and powerful as the "Cape" or coastline of South Africa, where the origin of the diamond market as we know it began, and subsequently changed the world. Cape colored diamonds look exceptional set in 18k rose gold and 18k yellow gold, which serve to highlight and really bring out the warmer tones offered by these exceptional diamonds, which Brian Gavin is now producing in the same incredibly high cut quality that is visible in all Brian Gavin Signature Diamonds. Brian Gavin Cape Series Diamonds are now available in round hearts and arrows qualities, and there are even a few with blue fluorescence featured in the Brian Gavin Blue collection. Cape Series diamonds by Brian Gavin are an excellent way to break the barrier of higher carat weight, because the warm yellow tones make them extremely affordable. They are an excellent option for people who want a larger diamond, but don't want to have to break the bank in order to do so... And the fact that it is a Brian Gavin Signature Cape Diamond makes it all the more unique and special. History of Diamonds, Cape Town Diamond Museum, "The History of Diamonds"